• View topic - United Kingdom - lord lieutenant - badge of rank??? United Kingdom - lord lieutenant - badge of rank??? 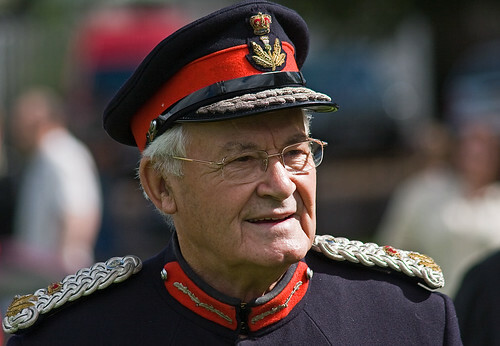 This is the Lord Lieutenant of North Yorkshire. Wikipedia described the uniform (more or less), but I can't find anything about the devices on his shoulder boards. In this case there's the rose from his cap device (worn, I read, by English lords lieutenant) and a Crown - rather like a lieutenant-colonel's badge of rank. Anyone have any knowledge of this? Re: United Kingdom - lord lieutenant - badge of rank??? I think he's wearing a crown and the Tudor Rose. That's about all I can tell you. It could be that the rose and crown are meant to be worn together as a single badge. Sadly, that's all I know. A Lord Lieutenant in England wears the Tudor rose with a crown over it. This is both their badge of rank and their cap badge. A Deputy Lord Lieutenant wears on only the Tudor rose as their badge of rank and cap badge. And the cap device for the Deputy Lieutenant reflects that! The gorget patch is that of a Staff Officer rather than a General Office, and one row less of oak leaves on the visor. So a kind of consistency throughout. Thanks!